Ok, so how fab is this little pink bow dress? I am in love for two reasons. One because this HOT pink color is so bright it could blind you, and secondly because the designer of this dress is Sage. I got this as a gift from one of my girlfriends for my birthday last month and was shocked to find that tag that read ‘Sage’. Even better, my friend had absolutely no idea until I opened the gift that this was the case. She only got it for me because she saw it on the mannequin at this cute little boutique (Blush in Norman) and said “omg, that’s so Sage..I have to get it for her for her bday”. What a perfect match :). I love all of the dresses from this line and will now be a relentless buyer for obvious reasons. Speaking of my birthday (I know, it’s been too long since my last post) I had a couple people that caught my Polyvore bday wish list drift. 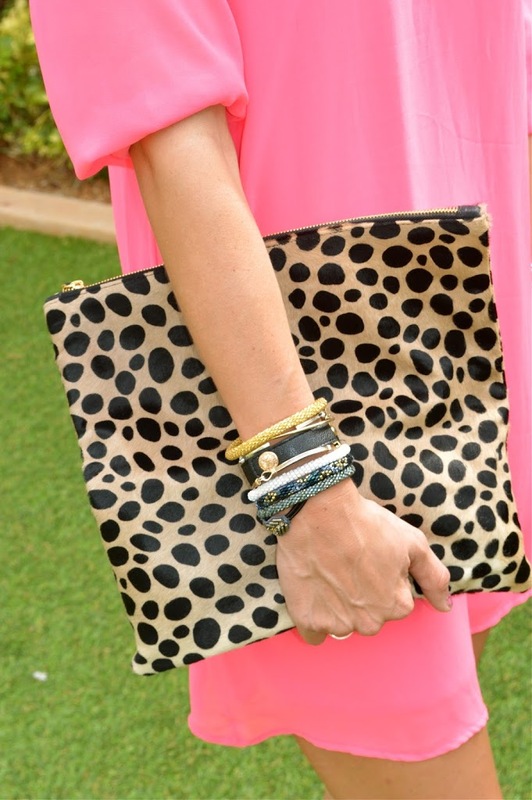 This amazing clutch…. c/o my stylish bf – Dane (thanks babe) was my fav. I have been dying for an excuse to wear this number ever since the cute little care package arrived at my door. Although the dress was so perfectly loud, the clutch steals the show in this getup. The leopard print really pops on a solid bright background. Obsessed, obsessed, obsessed! Enough about me though, the real reason we were in Miami was for my beautiful sisters bachelorette party. I was the Maid of Honor and had SO much fun planning her weekend trip to Miami. We had a party of 10 and things got wild of course. I styled my sister in all white the entire weekend (literally). Stay tuned this week for more fun posts from Miami babyyy.